The US Air Force has dismissed the leader of its prestigious demonstration team, ‘Thunderbirds,’ citing a lack of confidence in his leadership and risk management skills. The retirement decision comes less than a year after his appointment. The Thunderbirds, based at Nellis Air Force Base in Nevada, completed their 2017 season in early November. 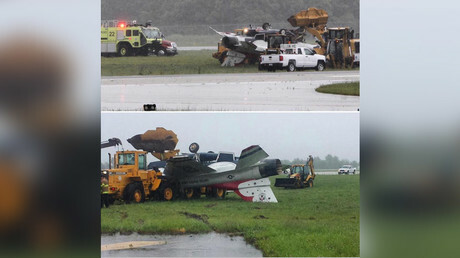 The season included over 70 air shows and was marred by a June incident, in which one of the team’s F-16s overturned after landing in rainy weather during a training flight. The $29-million aircraft was destroyed while the pilot, Capt. Erik Gonsalves, sustained minor injuries. The team had to skip an air show in Dayton, Ohio due to the crash. A subsequent inquiry by the air force said that the crash could have been avoided. Military.com cited squadron spokesman, Tech. Sgt. Christopher Boitz, who said in a follow-up email that the decision to dismiss Heard was not directly related to that particular incident. “This decision was made based on inputs from throughout the 2017 show season,” he said. Heard took the position of team leader in January. His service record in the Air Force goes back to 1999 and includes 800 hours of combat flights in Iraq, Afghanistan and Libya. Lt. Col. Kevin Walsh, who has served as the team’s operations officer since 2016, was named acting commander of the unit until a new permanent leader is appointed.